Figure 1. 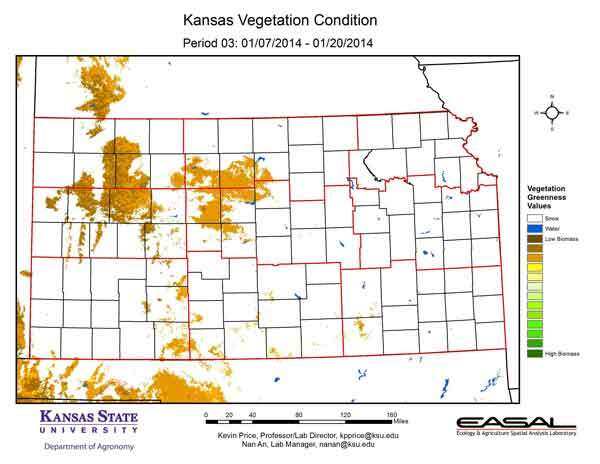 The Vegetation Condition Report for Kansas for January 7 – 20 from K-State’s Ecology and Agriculture Spatial Analysis Laboratory shows that the area of snow cover was less extensive this period than a week ago. By the 10th of January, snow depth in the west was zero to a trace, while snow depth in the northeast ranged from 1 to 5 inches. Figure 2. 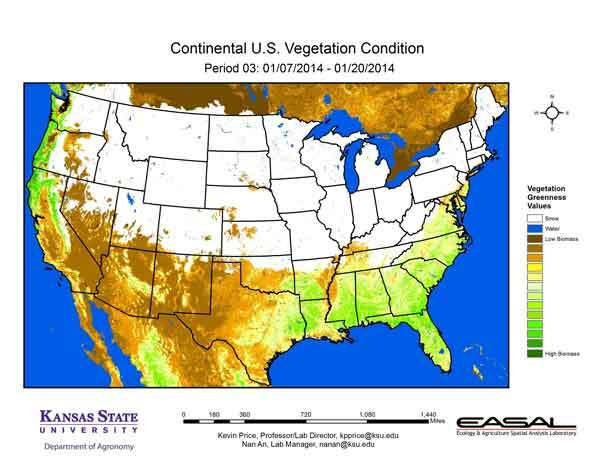 Compared to the previous year at this time for Kansas, the current Vegetation Condition Report for January 7 – 20 from K-State’s Ecology and Agriculture Spatial Analysis Laboratory shows that greater photosynthetic activity is confined to south central Kansas, particularly in Barber and Harper counties. In contrast, Sumner County is showing lower biomass productivity this year. Harper County has seen almost three times the moisture from October to January this year, than last. This has allowed much more vegetative activity. Figure 3. 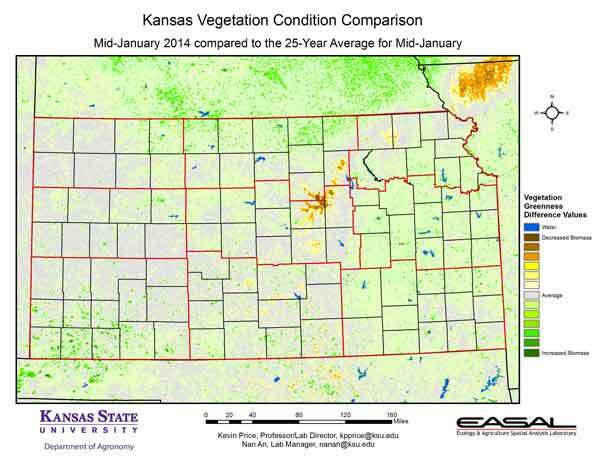 Compared to the 25-year average at this time for Kansas, this year’s Vegetation Condition Report for January 7 – 20 from K-State’s Ecology and Agriculture Spatial Analysis Laboratory shows that only a small area of central Kansas has below-average biomass productivity. This corresponds to the area of shrinking snow cover. Figure 4. 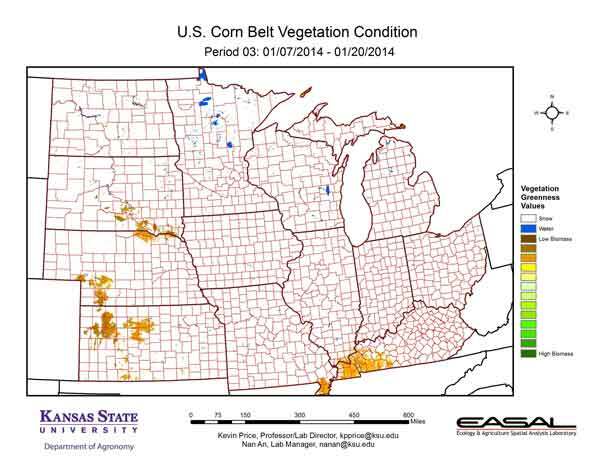 The Vegetation Condition Report for the Corn Belt for January 7 – 20 from K-State’s Ecology and Agriculture Spatial Analysis Laboratory shows that there was generally widespread snow cover throughout the Corn Belt. The biggest gaps were in parts of Kansas, Nebraska, and southwestern Kentucky. Figure 5. 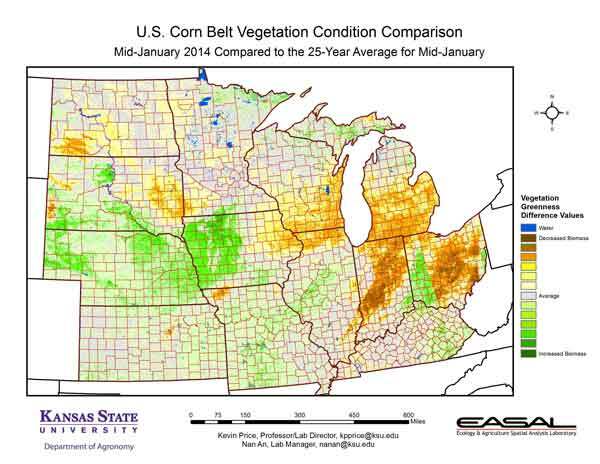 The comparison to last year in the Corn Belt for the period January 7 – 20 from K-State’s Ecology and Agriculture Spatial Analysis Laboratory shows that the eastern portions of the region have the greatest decrease in activity, while parts of Nebraska and South Dakota have the greatest increase in activity. In the eastern sections, snow cover has been much deeper and more persistent this year. For example, last year Elkhart, in northern Indiana, had no snow on the ground on the 10th of January. This year, the snow depth was 5 inches on the 10th of January. Figure 6. 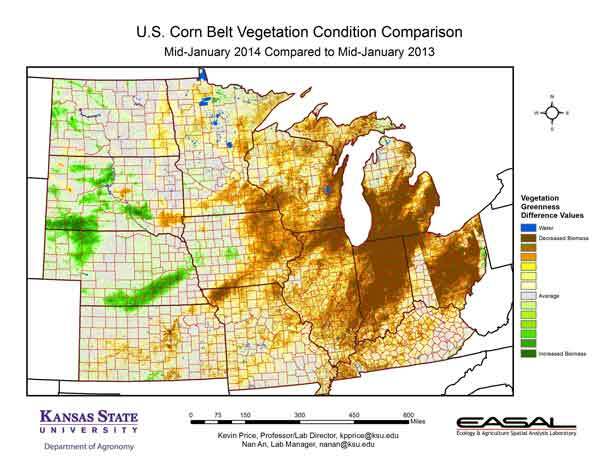 Compared to the 25-year average at this time for the Corn Belt, this year’s Vegetation Condition Report for January 7 – 20 from K-State’s Ecology and Agriculture Spatial Analysis Laboratory shows that Michigan, Indiana, and Ohio have the greatest area of below-average biomass productivity. The area of above-average activity in western Ohio is an artifact of the image splicing, as can be seen by the very sharp line separating the above- and below-average productivity. Figure 7. 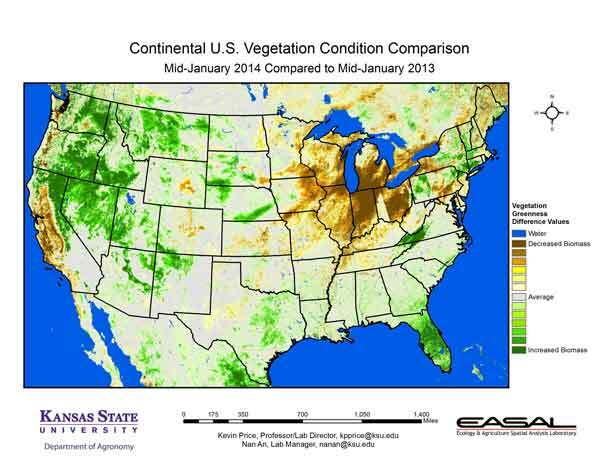 The Vegetation Condition Report for the U.S. for January 7 – 20 from K-State’s Ecology and Agriculture Spatial Analysis Laboratory shows that snow cover persists across the northern continental U.S. Noteworthy exceptions can be seen in northern California and western Nevada, as well as along the Pacific Northwest. Continued warmer-than-average temperatures and lack of snowfall have increased drought stress in these areas. Figure 8. The U.S. comparison to last year at this time for the period January 7 – 20 from K-State’s Ecology and Agriculture Spatial Analysis Laboratory shows that the Northwestern U.S. and Florida have higher NDVI values. In contrast, the Midwest has a high concentration of lower photosynthetic activity. High biomass activity at this time in the Northwest is not a positive sign. It is indicative of low snow cover and greater evapotranspiration activity, which can result in lower water availability. Note that a splice line in western Ohio is visible in this image. Figure 9. The U.S. comparison to the 25-year average for the period January 7 – 20 from K-State’s Ecology and Agriculture Spatial Analysis Laboratory shows that greatest area of above-average biomass activity is in the Pacific Northwest. There is also an area of greater-than-average photosynthetic activity in eastern Nebraska and western Iowa. Snow totals in these areas have been lower than average. The high NDVI values in western Pennsylvania are likely an artifact of the image processing. There is a distinct splice line in this region as well as in western Ohio.